The Falcon Clan was founded in 834 when the Emperor granted the Toritaka province to the son of Hayabusa, who saved the life of an imperial advisor from an assassin. Hayabusa's son, Yotogi, quickly uncovered that the assassin was a peasant maddened by the possession of an evil spirit. The Falcon found their meaning in life, studying the nature of ghosts and other supernatural occurances, which lead to a high demand for their services, especially among the Crab, with whom they quickly became allies. The world created by Amaterasu and Lord Onnotangu is a marvel of beauty and wonder. Their children, the Kami, led the ancient tribes of Rokugan into a golden age of honor and enlightenment. Yet even in the Empire of the Hantei shadows must fall. Darkness lies beneath every rock and behind every tree. Rokugani shun these places. fearing that the voices of the dead will speak to them there, gibbering in mad whispers. Worse yet. they fear that the hungry ones may come to devour their souls. Dark beings skulk at the edge of nightmares. The mighty army of the Crab holds back a horde of Oni at Kaiu Kabe. Their witch-hunters hunt down and destroy all vestiges of maho within the Empire. Yet by their side the Falcon Clan stands vigilant against the fall of night. Falcon eyes gaze upon the blasphemies that haunt the darkest corners of the Emerald Empire. They see spirits, hear the voices of ghosts, and listen, as the spirit of the land cries out for cleansing. The Falcon alone seek not to destroy the darkness but to understand it. Without knowledge, they say, one cannot protect the people from the fearsome grip of the Dark One. And it is just that they seek to understand: the darkness. in its own way, lifted the Falcon to their place within the Celestial Order. West of the Shinomen Forest and north of the Twilight Mountains lie the small farms and single castle that define the home of the Falcon Clan. Fresh waters from the forest feed their rich and fertile valley. The trees themselves represent a magnificent reserve of timber as well as specialized woods and spices. Yet the Falcon Clan remains poor. Travelers who cross the mountain pass or emerge from the forest and look into Tani Hitokage (Valley of the Spirit) remain until the sun sets, to watch one of the greatest beauties of the Falcon land appear. As the sun falls in the west suddenly a ring of fire flares into being, outlining the Toritaka province. This wall of light is the hundreds, if not thousands. of lanterns, that mark the boundary of the land. driving away the night. Dozens of lanterns light the primary village, guiding a traveler along paths and protecting homes from the darkness. Scattered around the outskirts of the village lay offerings of food, small wood carvings, and other trinkets. These tokens arc gifts to appease the angry spirits of Shinomen and to keep worse things at bay. Peasants fear the spirits that inhabit the land they work. None cut living trees in the forest. Few toil during the evening. Villagers pray for their safety and hope that the Falcon will leave this land or that the Fortunes will rescue them from the clutches of the forest. And the rest of Rokugan believes they have every cause to fear. Shinomen Forest is haunted. Villagers speak of angry spirits wandering the woods, ghostly battles destroying entire fields of crops, hideous snakemen that feed on human flesh, and the noises: wailings, moanings. and whispers that shatter fragile minds, leaving a villager dead with eyes open in terror and skin bleached white. So they toil, reluctantly, in the fields closest to Shiro no Toritaka. l'he castle and the Falcon provide the strength and courage the peasants need to survive a living nightmare. Or so they say. In truth, the land rests quietly, Peasants toil close to the castle. watched by Falcon bushi. 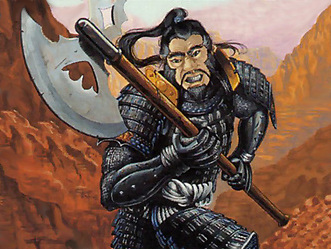 This discourages random attacks by bandits or wandering ronin rather than to defend the villagers from angry spirits. This does not mean that Shinomen is not haunted; quite the opposite. The Falcon speak of battles from a hundred years ago, when they were called into the forest by their daimyo to fight against demonic snakemen. Even today, a lone bushi, or occasionally a student and his sensei, travels through Falcon lands in the dead of night to find the yorei (ghosts). Panicked villagers swear the yorei are responsible for milk curdling, crops dying, and the fields themselves turning black with Taint. Shadows fall long and dark in this part of Rokugan. Through it all the Falcon stand guard, their eyes searching the darkness for an answer. Their words call to the spirits for succor, and claim that their Ancestors speak to them in the night. Every Falcon knows that his life may yet be given to defend the terrified peasants toiling in the shadow of the castle. More frequently than haunts and ghosts, bandits raid the Falcon villages. believing that the rich land yields a vast profit in rice and koku. Usually they strike at the outer fringe of the land. though occasionally a bold leader attacks the heartland of the Falcon. Between the fears of the haunted forest. and the small numbers of Falcon bushi, the clan finds itself hard-pressed to deal with the bandits effectively. They plead with their 'allies' in the Lion and Crab clans, but the great clans have no time to send a major force to end the menace. Instead. both clans tell the Falcon that they must deal with the problem on their own. The stoic Falcon refuse to waste their precious bushi chasing bandits through a haunted forest, and so the attacks continue. Some claim that the Hare. at the far side of the Shinomen, aided the bandits in order to disrupt Falcon resources. Those words are whispered very quietly, especially in the Emperor's court While the Hare and the Falcon had no declared conflict (given that their established lands are so distant from each other), they were in no way allied. Their rivalry extended over a hundred years of petty banditry, political ploys. and rumormongering in the Imperial Court, and those bushi who were allied to one or the other watch themselves during travel through their rival's provinces. All Rokugani know their places. In a given life, a man stands within the Celestial Order based on the sins and virtues of his previous life. Rokugani live honorable lives and conduct themselves with proper decorum in hopes that in a future life the Celestial Order will elevate them to a better position. Very rarely, a soul fulfills a portion of its dharma and the Fortunes smile on it. The Fortunes elevate these souls to Samurai and the Emperor grants them a parcel of land for their courageous acts. Long ago, in the small farming villages of Tasogare Mira (Twilight Village), an Imperial entourage stopped for an evening's rest. During the night, 'ninja' attacked the Emperor's chief advisor and his guards. A local farmer named Hayabusa came to the aid of the advisor, killing the ninja and saving the courtier's life only to lose his own to the assassin's poison. The advisor returned to Otosan Uchi taking Hayabusa's oldest son with him. The advisor described the farmer as a great bird that swooped in and cut down the vicious killer with his mighty claws. Impressed, the Emperor bestowed upon the son the right to hold a clan in the Toritaka provinces, in honor of the advisor's words. He was granted title rights to his village and the surrounding farmlands. Yotogi returned to the province, and with his three brothers created the Falcon Clan. 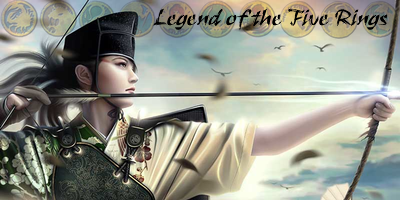 Yotogi enlisted the aid of a Lion magistrate and soon discovered the identity of the supposed ninja. He revealed the 'ninja' as nothing more than a maddened peasant possibly aided by dark magic. Yotogi summoned a Crab tsukai-sagasu who declared that neither the peasant or land evidenced any maho. Refusing to allow the question to fade. Yotogi sat within a temple to Fukurokujin (the Fortune of Wisdom) and meditated. He beseeched his father's spirit to help guide him in the formation of the new clan and to reveal the cause of his killer's madness. Seventy-three days passed while Yotogi meditated in the care of the monks. Toritaka province survived but did not prosper, and the local magistrates grew concerned that the lord may have abandoned his place to pursue the contemplative life of a monk. On the dawn of the seventy-fourth day, Yotogi emerged from the temple wearing a simple kimono and carrying a naginata on his back. He took a wife and immediately retired to the small castle still being constructed on his land. It is said that a bushi approached him and asked, "What did you learn?" Yotogi responded, -There are not enough names" From that day forward the Falcon Clan trained in the arts of meditation. Furthermore, every Daimyo takes the title "The Yotogr as symbolic of his vigil. People whisper that the Falcon's powers of awareness come from the guidance of their ancestors. Nothing hides from the sight of a Falcon. For while the Scorpion know the secrets of the Empire. the Falcon know what moves unseen within its borders. Falcon Sensei frequently take a student on an exploration of the lands at the edges of the forest. The student keeps an account ofthe evening's events. As they walk, the sensei describes what surrounds them and lectures on how to expand the senses and reach for the sensations that may hint of the yorei. The student is then left alone, deep in the forest for three days, chronicling their studies. If they survive, the scrolls are entered into the Clan's histories, and the student is pronounced worthy of the name Toritaka. Few gempukku documents speak of an actual meeting with a yorei or other spirit, but some describe horrible snake-bodied creatures, or hungry nightmares that creep through the trees late at night. The training received by Falcon bushi teaches them that failings of the flesh can strand a soul in this world. If the Falcon is visited by a spirit. they must attempt to aid the ghost in any way possible. If they are able to help them leave this world and continue on its kharmic journey, the spirit will give them a token, and their position as a commander of the Falcon guard is assured. It must be noted that some young bushi never return from the Falcon woodlands. The Falcon maintain a small school dedicated to the mysteries of the world that surrounds them. Living on the edge of a haunted forest places certain demands on the daimyo of the Falcon lie must protect the peasants from the darkness that lurks at the edge of nightmare. When a member of another clan - even a member of a Great Clan, requests that their child be enrolled in the Falcon school, they are in for a polite shock. Most likely, they will be refused. This is not because the Falcon wish to hide their secrets, but because they do not wish to be responsible for the loss of any life that is not their own to command. The school grounds are small with only a few buildings and a single dojo. Most students spend their time in meditation or sparring with practice weapons. Students are required to tell their sensei everything they observed every day. The sensei questions the student further so that the young Falcon learns what details they missed. When not meditating or practicing, the student reads fading scrolls that describe events involving the gaki, ubume, goryo. and shirya. The inquiry of Toritaka Yotogi set the stage for the Falcon Clan. Obsessed with discovering the peasant's fate, Yotogi directed his students (and ronin that joined him) to watch the shadows around them. They learned that a presence must be felt rather than seen. Yorei stalk their lands, often hidden from sight. Every feeling a Falcon experiences, every nightmare they suffer, everything that happens without a known cause is documented by the clan. Students and masters alike pore over these writings in hopes of gleaning an understanding, an answer, an insight, or anything at all from them. Usually, the writings raise more questions then they ever answer. When meditation and research fail, the Falcon explore. They travel the nearby land and forest attempting to find their prey. They do not trust their eyes as much as their minds. The explorers put their meditations on awareness to use and simply wander, allowing their feelings to guide them. Occasionally, a yorei is found. Occasionally. a Falcon does not return. Very rarely, a Falcon returns to write about what he felt and saw; these records are prized possessions and kept under constant guard in the Falcon library. Falcons often die before age has a chance to catch up to them. When the Falcon speak of their fallen brothers, they regard these samurai as brave explorers into another world. Those who do survive into ancient years always retire to a small monastery in the Falcon lands, and travel no more. Though rarely given, such a Falcon's advice is highly sought. Usually these Falcons join the Douzokukai Tasogare (Council of Twilight). They keep what they say behind closed doors and rarely record or discuss their discoveries with anyone. Certain Falcons learn something of terrifying importance. Most believe that after living on the edge of the haunted Shinomen, fighting the darkness of He Who Must Not Be Named. and actively seeking yorei, nothing could frighten a Falcon. Sometimes, on a quiet day or in the dead of night, a bushi who is meditating on the shadow of a leaf or where the candle light does not fall, runs screaming from the castle, his eyes open wide in terror and his breathing so heavy that his heart nearly explodes. At these moments, the Yotogi turns a little more ashen and the Douzokukai Tasogare convenes. The council members take the afflicted samurai with them. What they discuss no one can say: only one thing is certain. The council summons a Centipede shugenja to bless their pagoda with the light of Amaterasu, and pray that no shadows will fail within the tower. The Centipede. who have a pleasant alliance with the Falcon. are always willing to cooperate. Their clan philosophies are much the same, and the Falcon often send their female shugenja to be trained by the Centipede. Some say that the ronin who guard the Centipede valley seem far too insightful not to be members of the Haunted Clan, and perhaps they are right. The Falcon do not speak of such things; such agreements are for the Moshi and the Toritaka alone. Tales speak of the 'little ancestors'; mischievous spirits that plague those who behave dishonorably. Kitsu shugenja warn that a life of dishonor may strand a samurai's soul in this world. The lost soul must remember his purpose in living before he is allowed peace in death. To most, these stories warn or inspire caution; a threat to tell unruly children to behave. For the Falcon. however. they speak the unhindered truth. The Falcon learned from the Crab the realities of the Shadowlands. From the Lion they learned the importance of honor and what awaits them in jigoku. It did not take the Falcon long to decide on the value of honor and bushido. They treat these things with the utmost seriousness. Falcon bushi need only step into Shinomen Forest to see the results of a dishonorable life. They need only to hear the terrified peasants cry out in the night. One glimpse of a specter bleeding from her eyes teaches the Falcon better than any Lion book, any Crane lecture. The Falcon see first hand what the conclusion of a dishonorable life brings and they know better titan to tempt the Celestial Order. So they practice bushido and take great care to maintain their honor. However. the Falcon find it difficult to maintain the culture that the other clans create and the Crane are renowned for. Falcons are not known for their poetry or painting. They are, however, known for their skills of falconry. A nearly mystical attachment binds a falconer to his bird: no other clan can surpass the Falcon in this sport. Which serves as more than a display of their honor. A trained bushi and his falcon often see more than a lookout in a tower. The bird communicates with the bushi in ways none can fathom. Together a falconer and his raptor form the finest scout an army could desire. The Falcon Clan frequently lends a falconer to the armies of the Lion or Crab. For a small show of gratitude, the falconer scouts for the army on reconnaissance missions and aids in the planning of critical engagements. Such practices help replenish Falcon coffers. Given their closeness to unpleasant things. the Falcon usually avoid direct contact with the more 'courtly' clans of Rokugan. In fact, Falcon avoid Otosan Uchi as often as possible. They know their lack of practice with more refined courtly arts leaves them open to dishonor. As a result, the Falcon avoid dishonor by simply not placing themselves in such a position. For a Falcon there is no dishonor in not putting your honor at risk. As with combat, the most effective defense is to not be present for the strike. Some believe that their closeness to the Lion makes them targets for such political maneuvering, but no evidence supports this. The Falcon refuse to learn the laijutsu cut, a direct affront to the favored duel of the Crane and the Emperor. Rather, Falcons who find themselves challenged to a duel set the rules: non-lethal confrontations of form and awareness. Blindfolded duelists strike thrown apples with naginata or katana. Other times a demonstration of kendo again without sight, decides the victor. To date, no Falcon daimyo has permitted a lethal duel. The scarcity and importance of Falcon bushi prevents the daimyo from permitting his men to cast away their lives in duels, even if he feels certain they will win. Through their long history, the Falcon have most often associated with three clans: Crab, Lion and the ruined Hare. Usually their dealings with Great Clans involve sending scouts to assist with reconnaissance. For the most part. Rokugan does not concern itself with Falcon. One clan, however, refuses to heed the warnings and tests the Falcon's resolve. Hitokage and the nearby forest holds some of the finest woods and fertile land known in this part of Rokugan. Rumors even allude to diamonds in the Twilight Mountains, diamonds that Falcon peasants refuse to mine. The Hare Clan often cast their eyes across the river to the lands of Toritaka province. Before their destruction, the Hare had twice attempted a formal war with the Falcon. Since they have fallen. no attacks from the Hare have been seen: but the Falcon do not forget the bad blood between their two families. In one particular instance, the Hare claimed the farmland lust beyond the river in Falcon territory. The Falcon let them keep the land. Within a month, desperate messengers arrived from the flare pleading for assistance from the Falcon. The Hare implored the Falcon for aid in defending the peasants from bandit raids. The Yotogi sent troops to aid the Hare and days later the Hare withdrew, leaving the lands once again property of the Falcon. Neither clan speaks of the reasons for the Hare leaving the province. The incident has come to be known as the "Three Week Visit".